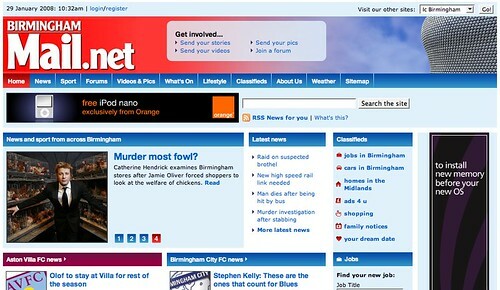 I think it’s universally accepted that the icbirmingham (and other ic.. sites) are pretty poor, for navigation and layout at least, even if the content is there – so it’s nice to see a fresh screen layout with obvious catergories and – which comes as a shock – pictures! Yes, there are quite large banner ads, but so far I’ve not seen any that pop-up over the text – that’s admirable restraint, far more than The Guardian, for example, shows. Good going. There are RSS feeds, loads of them, in sensible catergories – they’re not publishing full content tho’, which is dissapointing. It needs to be a very catchy headline/summary to pull me to the main site, but we can understand how it can be difficult for a print-based business to think of monetarising feeds from the off. Columnists’ feeds in full would be a nice easy way to break them in gently – an ad at the bottom of feed content isn’t obtrusive, and can be really targeted. Not even publishing full content on the site is a little more of a mistake: “For more on this story, read today’s Birmingham Mail.” is a dreadful phrase that appears at the bottom of some of the news items. This is quite a big omission, particualrly as the web becomes this huge searchable archive. People hitting old pages need to see the full text – imagine the google searches that will bring you to the Mail site, but if you find precious little content you’re not going to click – bye bye long tail ad revenue. A compromise would perhaps be to flesh out with the full story the next day? There’s use of tags, which is good, and good tag and related tags pages as a way of browsing. I’m not sure everyone’s quite got it yet, a page about a sausage tasting is tagged “sausage tasting” – is this going to be a regular one? (As an aside the tag page for sausague tasting doesn’t have any stories on it – a technical issue to solve I think.). The blogs are quite hidden – not in the main navigation, only at the bottom. So far there’s no commenting on stories, but there are forums. One hell of an improvement overall, go have a look and tell us what you think.